Mayor Ken Livingstone insists London's Olympic Stadium will not be turned into a football ground after the 2012 Games. Rumours persist that Premiership clubs West Ham or Tottenham could move to the stadium once the Olympics are over. But Livingstone said the International Olympic Committee would block any move to change the stadium's future use. Livingstone said: "The deal we made is that it's an athletics stadium and we have a legally-binding contract which is more like an international treaty." Livingstone added: "I can't make any change to that without the IOC agreeing. "If I and Seb Coe said to the IOC 'we know we promised you an athletics stadium but we'd rather have West Ham in there as they'd make more money out of it', they would say 'we have a contract and you can get lost'." You want something where there is a working partnership with the developer and not simply arguing about who pays if there's a cost over-run. 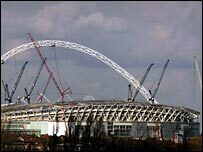 Livingstone also revealed that London 2012 organisers have learned lessons over the delay in building the new Wembley stadium. Wembley builder Multiplex expects to lose £75m on the project and has been liable for daily penalty payments of £120,000 since 31 January for not completing the stadium. The Mayor said: "If there has been anything stupid about the way it has been gone about, it's the idea that you simply draw up a contract with someone to build it and transfer all of the risk on to them. "The lesson we have got out of the Multiplex and FA problems is that adversarial contracts are not what it is all about."